New Delhi: As part of its diversification initiatives, Bharat Heavy Electricals Limited (BHEL) has expanded its footprint in the transportation sector with the flagging off of its first 6,000 HP electric locomotive (Type WAG-9H). 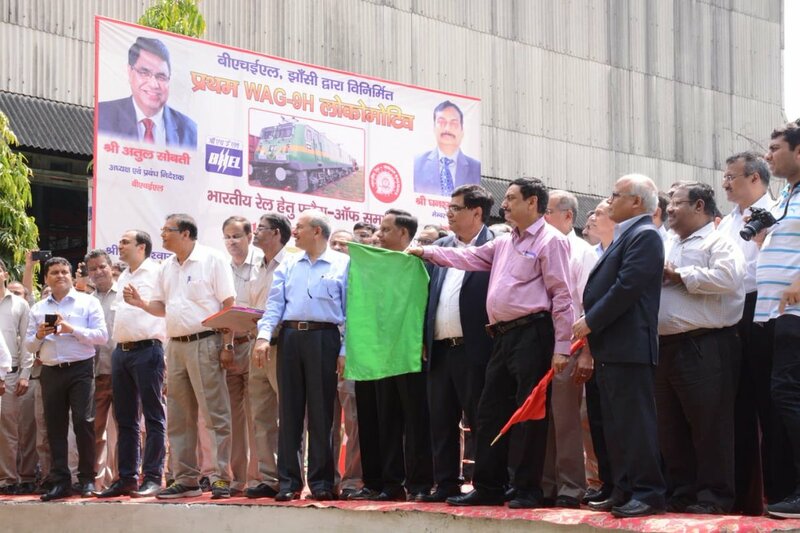 The BHEL-manufactured locomotive was flagged off by Mr. Ghanshyam Singh, Member Traction & Ex-Officio Secretary to the Govt., Ministry of Railways, in the presence of Mr. Atul Sobti, Chairman & Managing Director, BHEL from the company’s Jhansi plant. Directors on the board of BHEL and senior officials from Indian Railways were also present on this occasion. A pioneer in the transportation sector, BHEL has been working very closely with Indian Railways for the last six decades to meet their requirement of electric propulsion equipment for rolling stock and mainline electric locomotives. The 6,000 HP locomotive has been manufactured against a prestigious order from the Railway Board for 30 locomotives. Significantly this is the first electric locomotive equipped with state-of-the-art IGBT based 3-phase propulsion system with regenerative braking and air-conditioned cabin & water closet, to be manufactured by BHEL. BHEL is fully geared up to cater to the growing need of Indian railways by offering solutions with latest technological advancements. BHEL has created a dedicated centre for research and development in transportation technology and manufacturing facilities at Bhopal, Jhansi & Bengaluru plants. The company has a dedicated loco manufacturing facility with a capacity to manufacture about 100 locos per year and has already supplied 360 mainline electric locomotives to Indian Railways. BHEL has a share of over 50% of railways requirement for electric propulsion equipment for rolling stock. The company is continuously making efforts to develop high technology products and the country’s first ever Air-conditioned AC EMU train for the Mumbai sub-urban region, with state-of-art IGBT based 3-phase drive propulsion equipment by BHEL. Recently, it has completed satisfactory operation of over 100,000 kilometres in the last 8 months and another 12 rakes are slated to be inducted in the next few months to enhance passenger comfort. BHEL has embarked upon a transformation journey for ‘Creating a BHEL of tomorrow’ and is pursuing various diversifications initiatives for increasing non-coal business. It is extending its offering in the transportation segment and has equipped itself to foray into manufacturing of metro coaches, rolling stock for high speed railway, Railway electrification and environmental friendly & efficient rolling stock for Indian Railways.